I graduated from Harvard Business School with my MBA and $95k of student loans ($101k including accumulated interest) in 2009 at the age of 26. After graduation, I started a job with a modest income (relative to my banking and consulting peers) in the tech industry of Austin. Since graduation, I’ve made 21 monthly loan payments at $1,057 each. After paying $22k towards my $101k of loans, the balance stands at $90,717. That’s absurd. The math indicates that I’ll pay $42k in interest if I go to term (10 and 15 years) with the various loans. Thanks, but I’ll pass. Enough is enough. I’ll do everything in my power–short of lying, cheating, and stealing–to pay down this debt in the next ten months. I don’t have a huge stockpile of cash, my 12-month salary after tax is less than the principal of my loans, and the ten-month timeline is completely arbitrary. So, quite frankly, I have no idea how or if I’m going to pull this off. From this blog, you can expect an account of my adventures as I cut costs and look for supplemental income in an attempt to pay down this enormous debt weighing down my balance sheet. Today is 8-29-11 and the target completion date is 6-29-12. I graduated with my MBA from Harvard Business in the middle of the Great Recession: May 2009. I had a truly fantastic experience, and am grateful that I went. I learned a lot and made a lot of friends. I have no regrets. Thank God I found a decent job in the doldrums of the recession–I had borrowed $95k to fund that education, and that was after Harvard gave me a fellowship of $54k. (All I had to do was write two thank you notes to the trustee to get that particular award. I had been a superivsor in factory prior to enrolling, so they knew I wouldn’t turn down a hand-out.) Once the interest I accumulated on the loans over the two years that I attended school was capitalized, I owed just over $101k. It is a veritable loan cocktail: a mix of Federal loans (Stafford/Ford, Grad PLUS, Perkins) and private (CitiAssist and a subsidized HBS loan). I had a six-month grace period after graduating, and made my first loan payment during the same week as Christmas in December 2009. The monthly payment is $1,057, which can actually pay the rent on a decent-sized, brand-new apartment in the middle of downtown Austin. My thoughts at the time: Merry Christmas! Bah humbug! Yesteryday–21 months after that first payment–I logged on to a couple of sites to review my various loan principals. What started at $101k has been worked down to $90k. And then it hit me: I don’t want to be paying these notes until I’m 41 years old. In fact, I don’t want to be paying them when I’m 30. It’s not that I can’t afford the $1,057/month–I’ve budgeted for it, and I live accordingly. It’s just that I don’t want to pay the $42k in associated interest–when all is said and done, I’ll have paid $137k at my current payment rate–and I don’t want this drag on my paycheck for the next 15 years. Unfortunately, I don’t have any get-rich-quick schemes. I don’t have a killer business idea, I don’t gamble, I don’t play the lottery, and I didn’t interview for banking or consulting roles that would have made short work of that $101k. I enjoy my tech job and living in Austin, and I’m doing exactly what I wanted to be doing when I graduated from HBS two years ago. It’s worth mentioning that I’m not insanely talented at anything, so I can’t sing and dance my way out of this, either. And Peace Corps can only defer loans and forgive 10% of a Stafford loan. Trust me, I checked. The “cut costs” part will not be easy, as I already live fairly frugally…for the most part. My biggest expense–after the mortgage on my home–is entertainment (including travel). The past four months, I have averaged around $1,300/month in entertainment dollars. That is a little less than my mortgage+property tax+insurance, which is $1,440/month. So the entertainment side of my life is roughly equivalent to my mortgage. What can I say? I like to party. That will need to change. My (used) car and (used) motorcycle are paid off, and I don’t have any expensive hobbies. So, with the exception of three trips in October–Ann Arbor for a Michigan alumni event, Ashville for a wedding, and Detroit for a wedding–I’m staring at ten months of lots of free (read: boring) fun. Reading comes to mind. But so does cycling and running, so maybe it’s not all bad. That is, if I don’t sell off my bike to meet my goal. And can afford to replace my running shoes. And in case you were wondering, yes, I do regret booking those trips, but the tickets were purchased before I set this goal, and they’re non-refundable. It’s a sunk cost and I’m going. The “increase revenue” part is where this blog gets fun. I already tried to cash out my 401k, but that was a non-starter–I’d have to quit or get fired to get that cash, and subjected to a 10% early-withdrawal fee and income tax. So it’s going to come down to working more. I don’t really want to work evenings as I value my gym time way too much, and my job often requires me to take nighttime conference calls with Asia since my colleagues there work during those hours. So I need to find a weekend gig, which invariably means something related to manual labor. – Landscape maintenance such as weed-eating, raking, etc. – General maintenance and repair of simple issues (leaky faucets, etc. )Please email us your resume with a cover letter or a few paragraphs telling us about yourself so that we may get a feel for your personality. I am extremely interested in the role you placed on Craigslist. Based on my background working as a rough carpenter for four summers and my solid work ethic, I could add a great deal of value in the role you described. A cursory glance at my resume might cause you to raise your eyebrows, but please let me explain my motive in reaching out to ask for the job in question. I received my MBA from Harvard Business School in 2009, and with that diploma came over $100,000 of debt. I am gainfully employed and have paid off 10% of that debt in less than 18 months. However, I am growing tired of the debt, and I have set an audacious goal to pay off the remaining $90k within ten months. One way I’ll be achieving that goal will be to dramatically cut back my expenses; the other way will be to take on a weekend job to increase my overall income. My long-term goal is to own my own business, and I believe that working at your place of business, which you describe as a small, close-knit family type of environment, is exactly what I am looking for. I believe this sort of exposure–no matter how limited–will give me an idea of what it will be like to run my own business. There are some things that business school can teach, but it can’t provide one with the experience of actually working at a small business. As I said earlier, I used to be a carpenter during the summers I studied at Michigan. I miss working with my hands and doing manual labor–it feels good to create and actually “do” stuff other than make spreadsheets and answer email all day. I also have general handyman skills that I learned from my father, and I do all of the yardwork, repairs, and maintenance at my house here in Austin. I would really like this job, and I hope to hear from you soon. My resume is attached; thank you for your consideration. I hope to hear from you soon. Will they reply? Will I get the job? Will they take me seriously? Am I even qualified for the gig? I’m anxious. Let me know if they need a reference, Joe. Yeah, I am going to second Charley’s suggestion. You’re a good looking dude with a rocking body. You can make decent money doing solo films but the real money is in bottoming. You are ridiculous. I look forward to watching you somehow pull this off. Best of luck. I know someone who went to Yale and ended up with a debt of $90K. He took a part-time gig as a bartender on top of his consulting day job to pay down the bills. It was a wonderful experience, and he actually does that full time now, so who knows where this will lead you. Shameless plug: If you’re looking for ways to cut your food budget, might I kindly suggest you take a look at my blog which was started as a result of my husband getting laid off quite unexpectedly in 2009. We’re both happily employed now, but I write this blog to help others who might find themselves in a similar situation. Molly, thank you for dropping a note, and for letting me know where to find some cheap eats. I’ll check it out. I’m glad you guys are doing well now. Great idea for a blog, I’ll subscribe to follow it. May I suggest you get a twitter account too? That’s a good way to tweet things which wouldn’t stand alone as a post but might be an insightful part of your journey. But if you do that, I recommend some kind of backup service, because it only saves the last 3.5k tweets and if you use it a lot you might lose some posts. If you do, make sure to follow me at @tomdavenport and I can follow you back. Sorry, did I read that right? A friend of yours with a Yale education got a second job as a bartender and when he paid off his $90k debt, he continued working at it full time? Wowser. Do you have non competes that stop you from doing consulting in your field? I’m a small business owner (http://SmartFlix.com, http://HeavyInk.com) and if an MBA came to me and told me that he could increase my profits for the price of janitorial labor, I’d leap at the offer. Let’s do it, man. 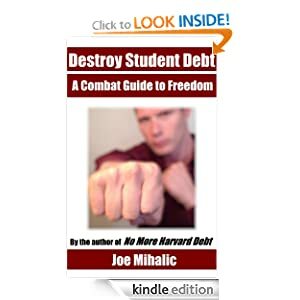 feel free to shoot me an email at nomoreharvarddebt@gmail.com if you want to start a conversation on it. I bet they’ll reply – that was a well-written cover letter. Just subscribed to your blog – keep those posts coming! All the best of luck. They never replied…none of my the manual labor posts on Craigslist led to anything. Thanks for the compliment, though. I heard about your site through Ramit Sethi on Twitter. Bravo to you. My husband and I have a ton of school debt and I’m inspired to rethink our repayment timeframe. Glad to hear it–best of luck. It feels like a lot people are in our boat. I found your blog through a tweet from @ramit. I live in Austin too and wish you luck with paying off your debts. Thanks a lot, Sweta! At least we live in a place with low cost of living. Good call-out…going to try to avoid those for now since I want my revenue to be organic…thanks for the tip. If you’re “tacky” (your words) enough to give your debt a number, why aren’t you “tacky” enough to give your salary and expenses real numbers as well? This would give your blog much more concreteness and make it far more interesting. Salaries can be considered confidential by the people paying them. I’ve heard stories of people being fired for revealing their salary (it can cause conflict on teams, because somebody always feels like they’re getting screwed, whether they’re getting the same pay for what they think is more work, or less pay for what they consider the same work). Good call–I’m going to keep it at the after-tax, after-insurance level. I finally did it…still can’t figure out specifics because of the W2 allowances and insurance payments, but yeah…close enough. Best of luck to you, I am also inspired by your ambition and aggressive time frame. I also have student debt, only about half as much as yours, but it is still a pain to pay every month. I think that the service industry is a good options for a part-time job. Serving and bar tending is flexible and can provide a lot of cash. I work part-time as a server at a country club and can make $100-$200 a night. I look forward to reading about how everything turns out. That’s not a bad chunk of change. I’m going to look at that if the tuturing and landscaping gigs don’t work out. I wish you luck with this! I think your cover letter is great — I’ve often wondered how to land a second job when my resume would raise the question in employers’ minds, “why would she want to work here?”. I bet that letter at least results in interest and a response, if not an actual job! I’m curious. You went to Harvard. Clearly you’ve got some smarts and talents that are making some decent money. Why not use some of those skills? I’m guessing you make at least $40 and hour…and surely you’ve got to have some skills to be able to make $40 an hour doing something for someone else? Have you looked on any of the “freelance for hire sites”? That’s what I googled and came up with a dozen hits. For example (using skills I think you would have based on your post), what about helping small businesses develop tactical and strategic marketing plans? Helping them figure out their google analytics and where to spend the most bucks? Doing proformas? (I have an MBA and I hate them). OH! This one I really like. Helping people write their business plans, do their analysis, etc for SBA loans, start ups, pitching to VCs’ etc. That you could advertise with google ad words and a word press site and have clients all over the country. Bottom line…you need to make 9k a month to do this. I like the delivery job, but you won’t make 9k. You will also never have any time off or down time for the rest of your life. BTW, I don’t think people want insane talent. Insane talent can easily translate to “flaky and difficult to work with”. People want to work with people they like (this is important), are dependable, and get them results. Fulfill people’s ultimate fantasy and they will pay anything. Also, Ramit has a course called earn 1k about how to do exactly what you are talking about..make more money using skills you have. I don’t get anything from him, and I don’t even know him except I follow him on the web, but it might be something to consider. Google “I will teach you to be rich” to find him. Cassie, thanks for your feedback. I’m trying to make this as interesting as possible, so sort of looking for gigs that are off the beaten path, so to speak. $9k a month is what I’d have to make if I excluded my bonus, raise, two new roommates, and all the cost-cutting I plan on doing. I know my reply is coming way late, but it turns out I’m only 5k off my goal or $500/month of extra income, so I don’t need to take any super high-paying jobs. You should get a bunch of bunk beds for the spare bedrooms in your pad and sub-lease rooms to migrant workers. That would be a great way to increase cash flow. Otherwise I’ll finally leave MI and move into your pad. James, I sort of went in this direction…not on such a grand scale, though. That said, I could probably fit a bed in my master closet–it’s pretty big! This is an amazing blog. Just picked it up from your facebook newsfeed. I think last time I randomly bumped into you while I was there for my HBS interview. Looking forward to reading up on your adventure in the coming few months. Just got done with Stanford along with a big fat $140K student loan. Can’t wait to have it paid by end of this year / next year myself! PS: perk#4 makes the pedi-cab job worth it anyway! Prag, glad you’re digging it. Knowing you and the career you came from and the one you’re likely going to, you’ll pay yours down in about 3 months. Get after it! Found you through @ramit, and as I am a current grad student (graduating Spring 2012) I will be watching this blog with great interest, as I, too, will have to start paying my loans off too in a bit! Good luck on your journey! Kill it, Joelle! Squeeze the life out of those toxic loans. I finished grad school in May 2010 and am currently staring my ~$200K debt in the face. I look forward to following this blog and hoping to learn a thing or two from you. I wish you all the best! Holy crap, Rachel. That’s a ton. Hopefully you’re pulling down more than I. Good luck to you, too! ah the graduate student debt. Im finishing my masters and am staring down the barrel of the gun. i think ill have to take a year break (which is something I don’t want to do) in order to tackle the debt before jumping into the real work, the phD. Great blog! thanks, HP! Good luck to you. He’s learned how to make money blogging and was laid off and is able to support himself through that. Good luck! I’ll keep reading. Thanks, Stacy. I’ll have to check that blog out. Good blog, Joe………maybe you could make some bucks waitering…tips should be good in a great restaurant with great service! Good idea…will consider it if the ventures I’m tracking down right now don’t pan out. I only wish the best for you……..always!! I love this guy! Definately motivating this blog of yours. This is an amazing blog! It is very humbling to hear about your journey and thanks for sharing your experience! Congrats in paying it off, nomoreharvarddebts!